2016 marks the 400th anniversary of William Shakespeare’s death. It’s impossible to quantify the impact of Shakespeare’s work on (primarily, but not solely) the English-speaking world. Shakespeare’s observations about human nature are timeless. His plots, which have mesmerized readers and audiences for centuries, still have the power to captivate. And it is estimated that he added 1,700 words (e.g. countless, laughable, grovel, dawn) and numerous everyday phrases (e.g. break the ice, it’s high time, for goodness sake, what’s done is done) to the English language. 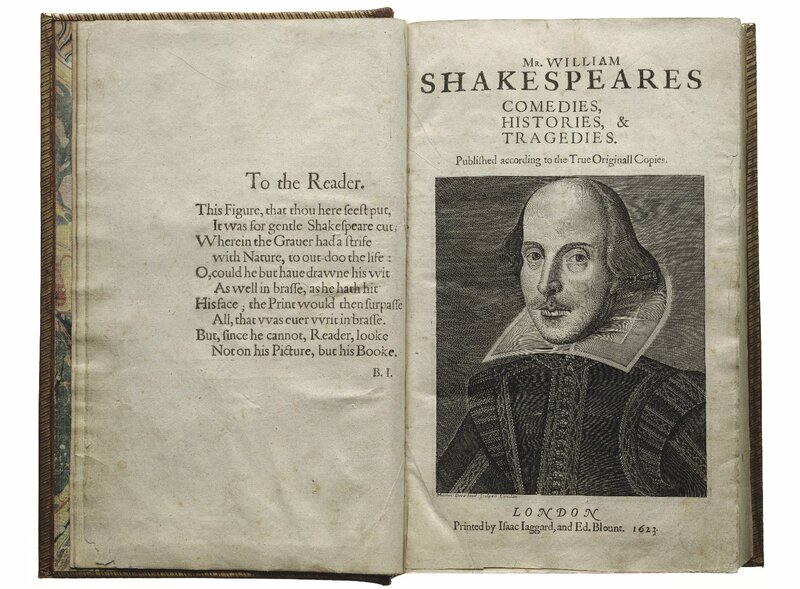 As its name suggests, the First Folio is the earliest collection ever amassed of a number of Shakespeare’s plays. Assembled by Shakespeare’s friends and colleagues seven years after his death, it contains eighteen plays that, were it not for the folio, may never have been preserved, including Macbeth, The Tempest, and The Taming of the Shrew. Printing a folio was expensive, so few copies of the book were made and even fewer survive today. This rare book may be viewed in New York City at the New York Historical Society from June 7th through July 17th; to find out where else it will travel, use this interactive map. Can’t wait that long to see it in person? You can read a digital copy of the First Folio in its entirety while you wait. In addition, the Library’s website offers excellent resources for teachers and for parents and kids. Those with an addiction* to Shakespeare because of his madcap*, zany* comedies; his monumental* histories; the remorseless* savagery* shown by some characters in his tragedies; and the overall radiance* of his words may consider it torture* to contain their excitement* as they await this ode* to the great man himself.